Updated version available here. Version 3.1 is complete. Version 3.0 of my AF assist tool is complete. 1. When photographing concerts or clubs, or any other venue where light is at a premium, the AF sensor in the camera can only do so much to give accurate focus. I am using off-camera flashes most of the time now so I am not relying on the ambient light to paint my scene; that’s what the flashes are for, but I still need to focus. 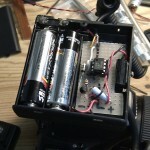 No remote flash trigger to date has had a AF assist light built into it. I use a Pocket Wizard Mini TT1 trigger and Flex TT5 receivers to trigger my flashes, along with an AC3 zone controller (which allows power control of 3 flash groups). So with a flash trigger in the camera’s hotshoe I loose my AF assist light, which normally I would get from a regular flash. 2. 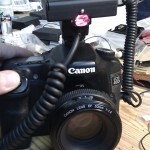 DSLR cameras (that I’ve looked at) don’t do AF assist in AI-Servo mode. They don’t allow you to track a subject in the dark, by continuously adding the light from the AF assist lamp on flashes to help the AF sensor in the camera continuously maintain focus. You get One-Shot focus, and once focus has been acquired, the light goes of. But if I want to track a singer as the move on a stage, like one would track a moving person or a race car during the day, you’re stuck. You can’t. This AF assist solves that problem but allowing full control of the AF assist light to be projected as long as you’re focusing (focusing is done by 1/2 pressing the shutter). How am I addressing those two shortcomings? 1. Moving the wireless flash trigger away from the hotshoe on top of the camera to the end of a ETTL extension solves that problem. 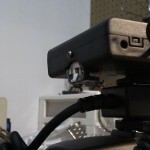 The AF assist light sits on top of the Yongnuo ETTL extension block that sits on the camera but does not electrically connect to anything there. 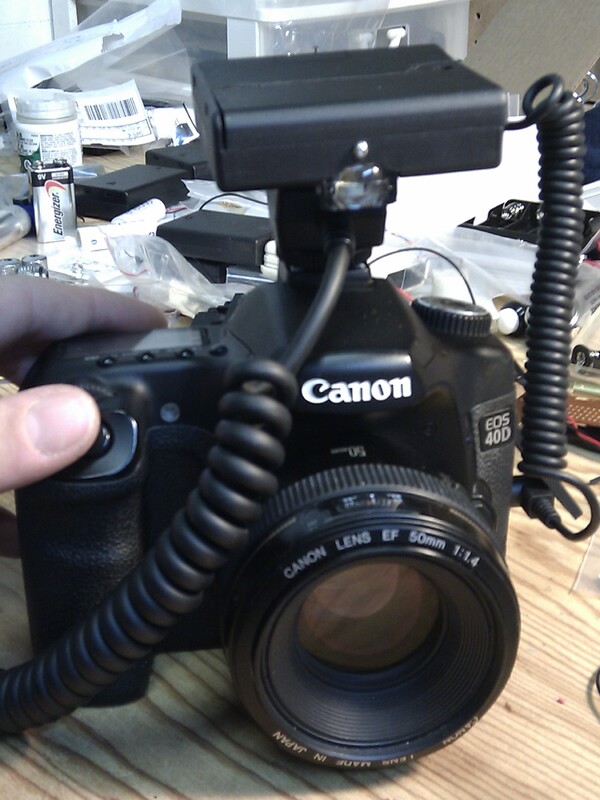 In the next revision I plan on removing the extension cord, and adding hotshoes attachment to the AF Assist box to keep everything mounted on top of the camera, with no ETTL extension cords. 2. 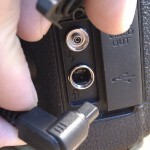 The connection is made on the side of the camera on the remote-trigger port. 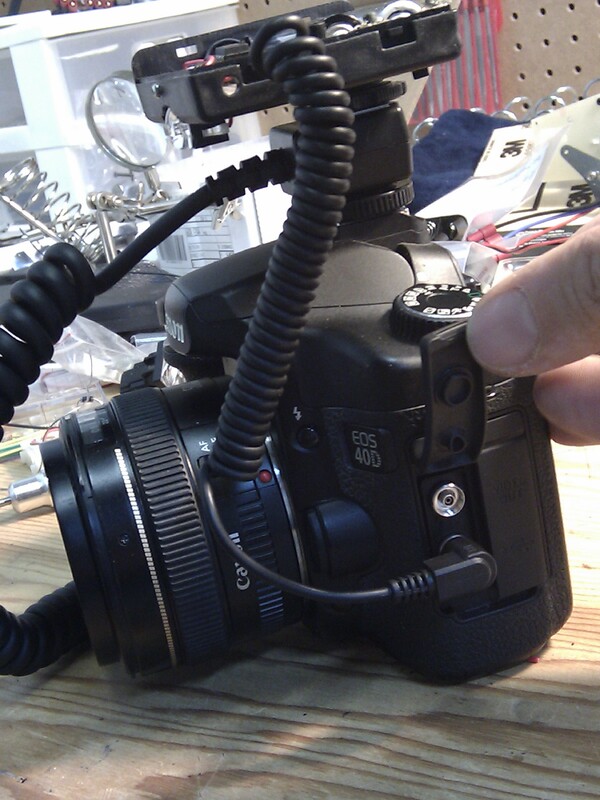 The connection there allows for the AF assist light to be on all the time while you’re focusing but 1/2 shutter press. Note, that this AF assist light does not get turned of from the AF-ON button on the back of the camera; only shutter 1/2 press. The previous version (version 2.0) worked around a defocused laser pointer beam, and the v3.0 unit works around an af assist light from a Canon 550ex flash. I figured Canon must have spent a bit of research time developing the best system to aid a Canon camera into focusing in the dark, so why not take advantage of that and not re-invent the wheel. 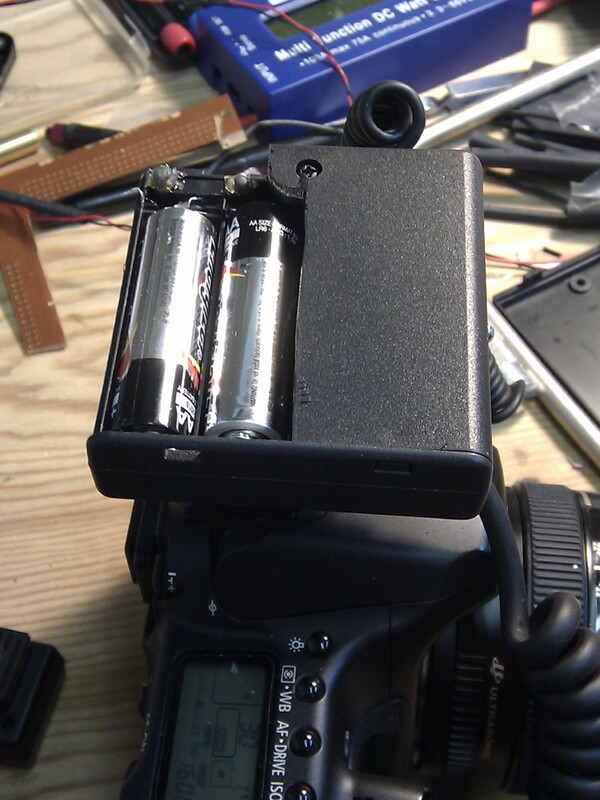 Other changes from the previous v2.0 model are the smaller enclosure, fewer batteries (2x AA in version 3.0 vs 4x AAA in version 2.0) and light is not triggered from the hotshoe anymore (hopefully causing less interference with the Pocket Wizard transmitter. The AF assist is now being triggered by the remote-control terminal (N3) port on the side of the camera. This is where normally a remote switch is hooked up to trigger the camera remotely. There are 3 pins there. 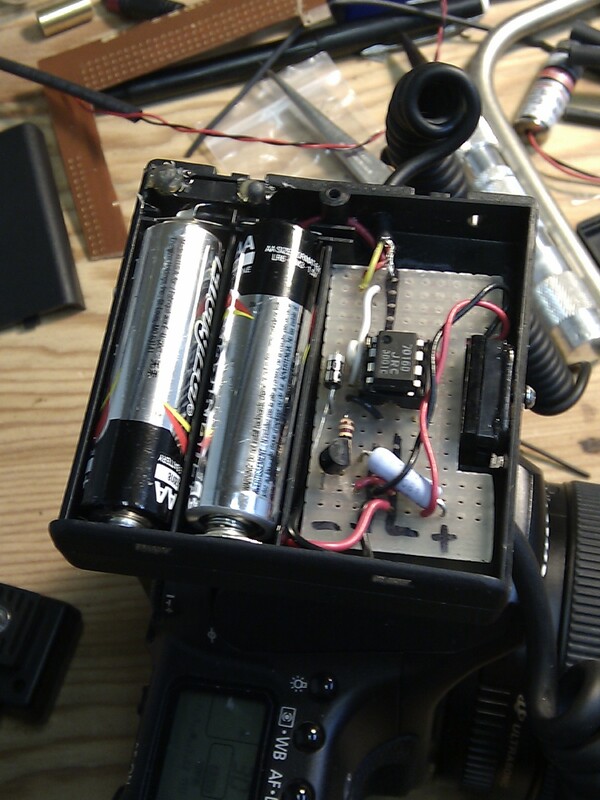 One is ground, one will trigger the shutter release a the third pin will engage 1/2 shutter press. Normally (without the shutter button pressed) the second and 3rd pins have 3.3v on them. When the shutter is 1/2 pressed, one pin goes to ground (0 volts) and when the shutter is fully pressed the other pin also goes to ground. 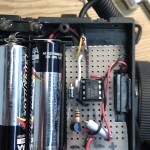 If the camera is configured to engage autofocus when the shutter is 1/2 pressed, then sensing a drop to 0 volts can be used to engage the AF LED simply through a transistor. 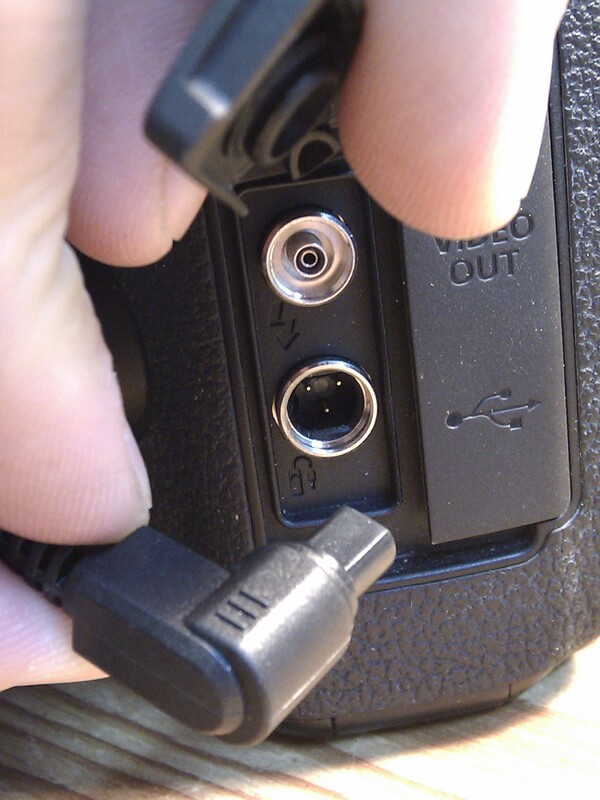 The AF-ON button on the back of the camera will not turn on the AF assist light. The schematic used is described in an earlier post, with only a minor change. 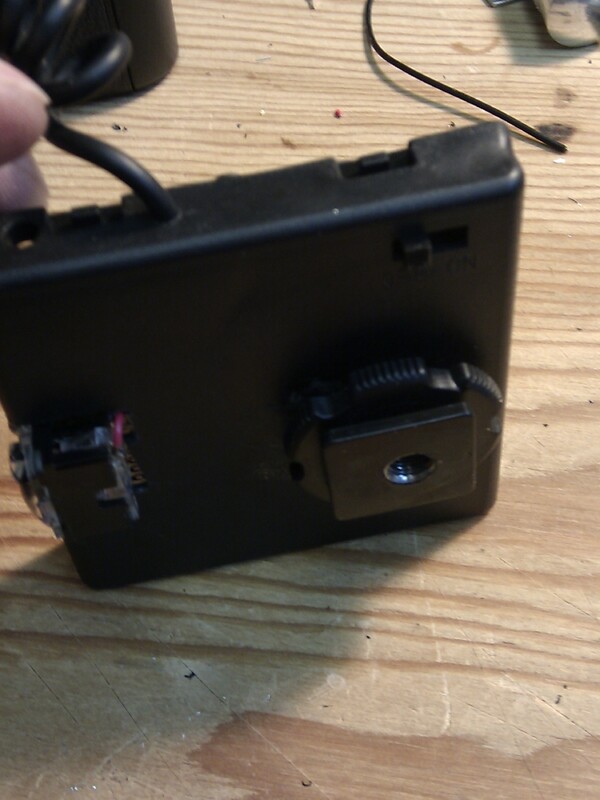 The potentiometer was not used. The visible light this puts out is not that distracting, and I doubt I will need to dim the light. Besides, a dimmer will waste energy. 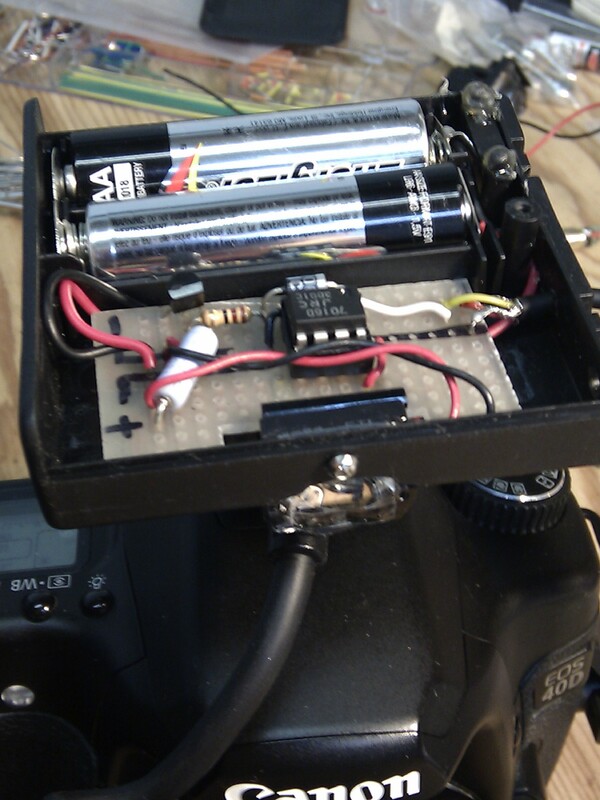 I have used an op-amp before the transistor to act as a buffer between the camera and the AF assist v3.0. A diode is used to prevent any current feeding back into the op-amp from the transistor and a 2watt resistor is lined up in series with the LED. 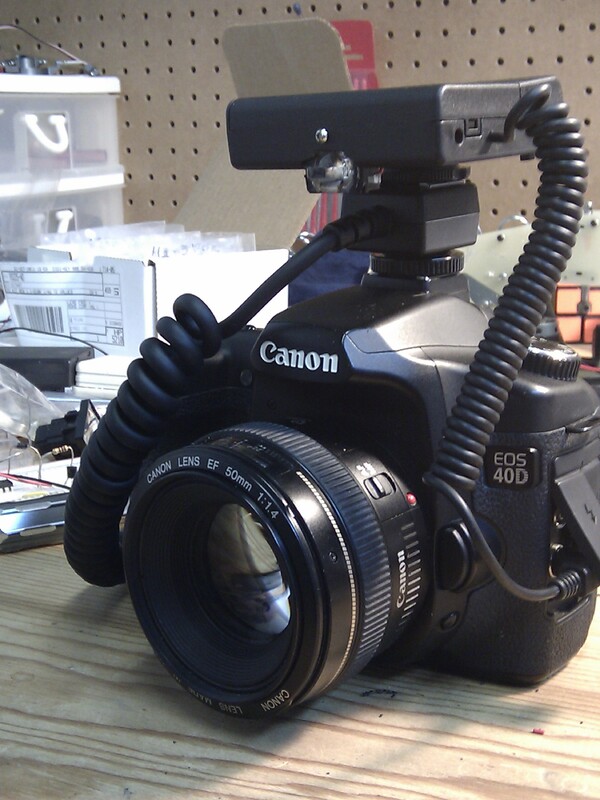 Currently the AF Assist sits on top of an E-TTL extension cable mount. 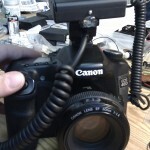 The other end of the extension is attached to a Pocket Wizard Mini TT1 (wireless flash trigger). 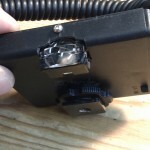 In subsequent 3.x versions I plan on incorporating a hotshoe pass-through on the case to allow for mounting the Pocket Wizard transmitter on top of the AF assist v3.0. 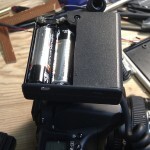 The AF assist v2.0 works with both Alkaline batteries (1.5v cells) as well as rechargable Ni-MH betteries (1.2v cells). One things I found surprising is that even thought there’s almost no distinguishable difference in teh visible light put out by the LED between 1.2v cells and 1.5v cells, the camera notices a difference. 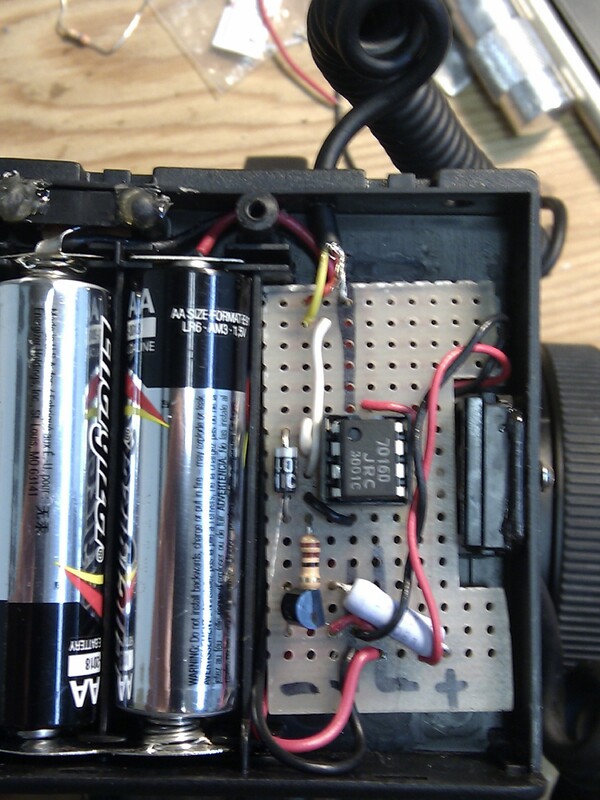 At 40ft on a blank wall the camera (in pitch dark) will acquire a focus lock using the 1.5v cells (alkaline batteries), but will not acquire AF lock using the 1.2v cells (rechagable Ni-MH batteries) . The lens used for both AF acquisition tests was a Canon 50mm f1.4. Will have to test a f2.8 lens (2 stops slower) to see how well this AF test works with a slower lens. 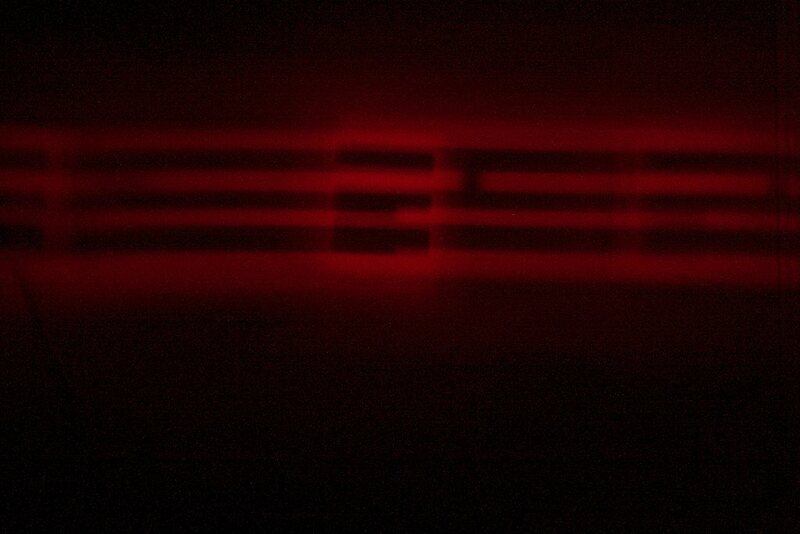 I have attached pictures of the light put out by the 1.5v cells (on the left) and the 1.2v cells (on the right).  I just need to field test the unit, and compare it with my previous v2.0 model. Will post updates in new posts, so make sure you check back ofter or grab the RSS feed for automatic updates! 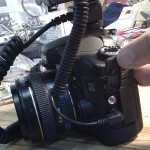 – The cable with the N3 connector that attaches to the camera’s remote trigger port. 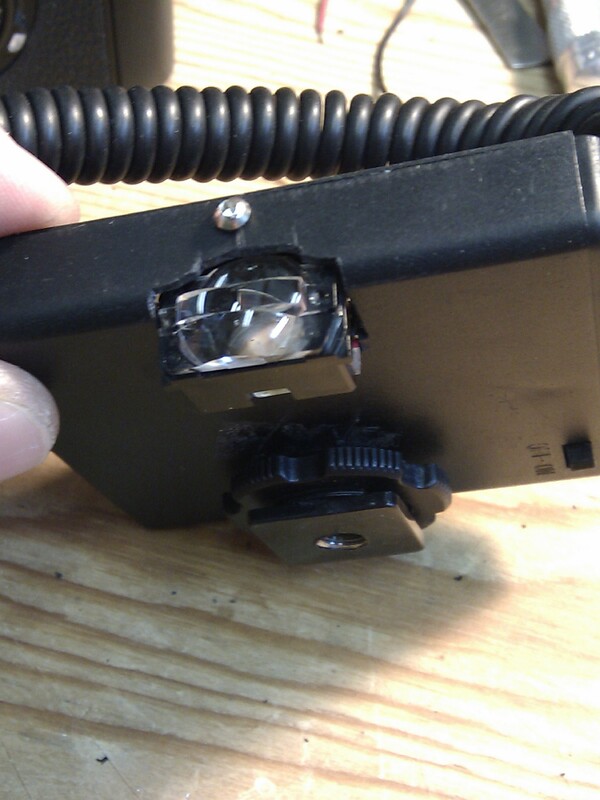 This was cannibalized from a cable that came with a Yongnuo RF-602 Wireless Remote/Flash Trigger. 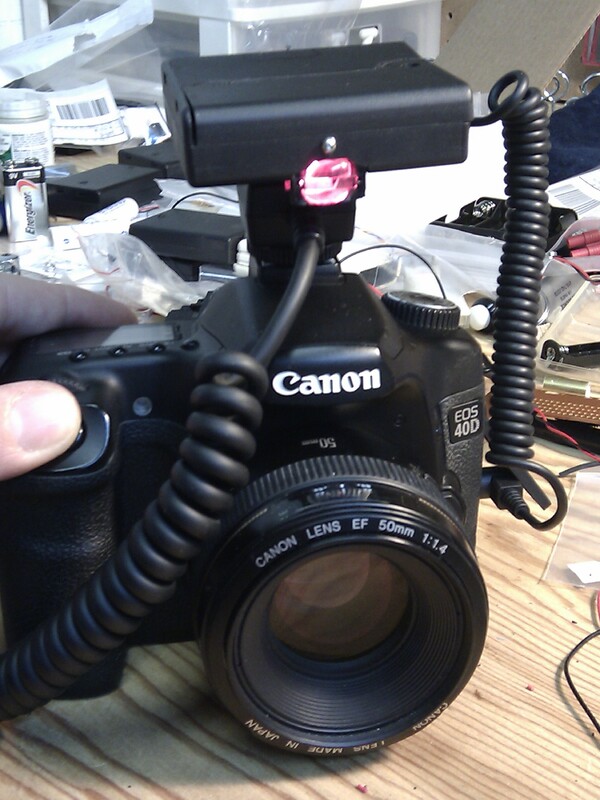 That kit came with a cable that allows for the camera to be remotly triggered. I just chopped off the other end of the cable and soldered to my board. – The hot show was taken from a Yongnuo ETTL extension cable. 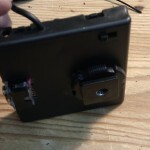 Upon opening the case (with the male foot that doesn’t have any electrical connections) there are 3 screws that attach the actual hot shoe to the case. Drilled the same pattern in my project box and simply moved the foot over. – The op-amp I am using is a NJU7016D. It’s a low voltage op-amp that can run on as low as 1V. The LM358 op-amp I had from the previous version of the AF assist needed at least 3v, and since I wanted to be able to run this on a couple of Ni-MH batteries (which would put out about 2.4V) I needed something that operated at a lower voltage. 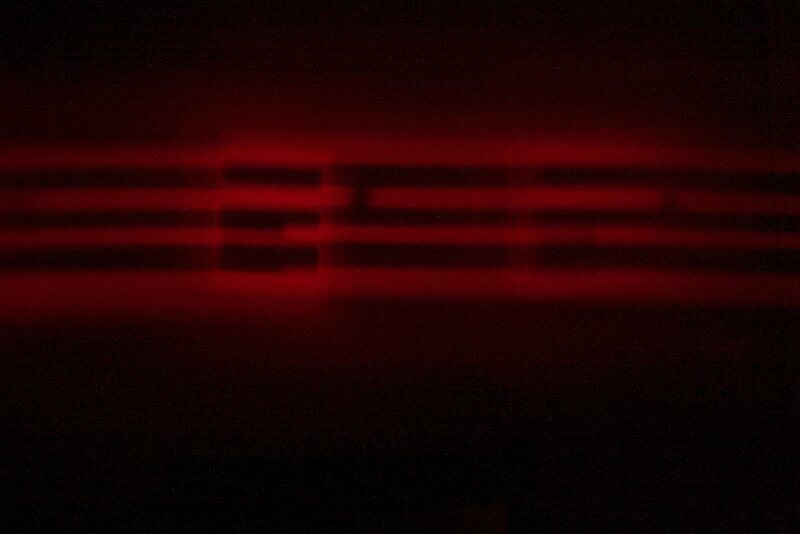 Below is the full photo album on images of this project in it’s v3.0 final form. 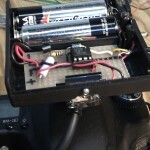 This entry was posted in DIY, Electronics, Photography and tagged AF assist on November 20, 2011 by adrian. The fact that you can sense the voltage on the remote control pins probably means that the remote control is connected directly to the button.  Any experiments with IR? I would be curious if it would work as most people are annoyed by the AF light. i could be wrong, but, i think the canon ST-E2 transmitter provides a focus assist beam. a trick i like to use is just use my 580ex speedlite mounted on the camera but disable flash firing from within the camera’s flash control menu. it will still fire the focus assist but wont pop the flash. Have you tried a small DC-to-DC converter to step up the voltage so you can use 1.2v rechargeable cells ? I have not yet experimented with IR. I will get to it as it’s been a question I’ve been wanting to set to rest (for myself) as there is very little info out there about this. you are correct. The ST-E2 does provide a focus assist beam, and it works great if it’s the only thing on the camera hotshoe. 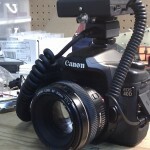 It does however not work in conjunction with a wireless remote trigger (at lease not with the Pocket Wizard TTL triggers) since there is no place to put it. 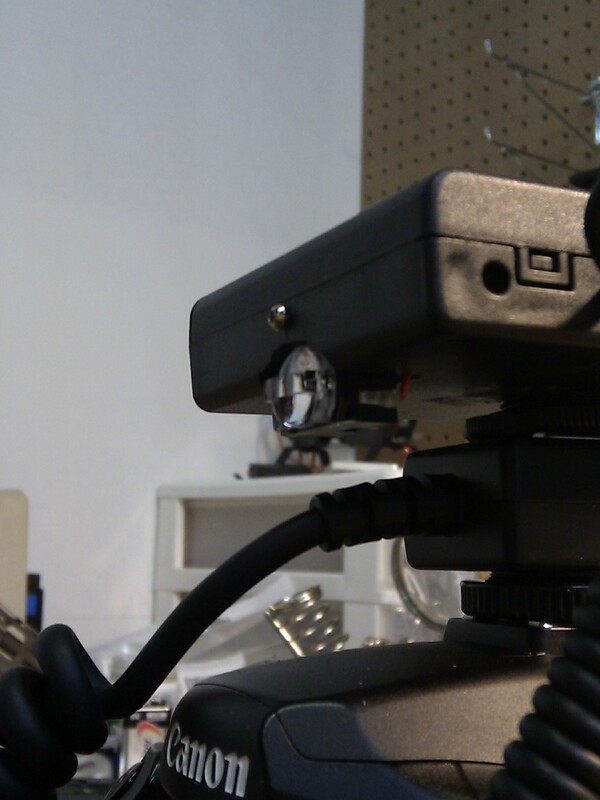 The PW MiniTT1 sits in the camera’s hotshoe, and the AC3 zone controller sits in the TT1′s hotshoe. Secondly, I want a focus assist beam that works in AI-Servo mode, so I can continuously track moving objects/subjects in darkness. No existing product today provides that functionality. I had considered it, but since there is only a small difference in LED intensity between the two voltages I skipped the DC-DC regulator. Also even a good DC-DC regulator will still waste about 10% of the power, and I didn’t want to loose any, though this may be something I will have to live with if I incorporate one in my next build. Use a “joule thief” with just one AA or AAA battery… The Joule-thief will boost anything as low as 0.5V up to 3V, more than enough voltage for your LEDs! I just heard a rumor recently that Pocket wizard may include an AF assist light in the next iteration of the TT1… no idea how far off that is.. but they’re thinkin about it! Thanks for the heads up. I am curious to see how they implement this in their design. If PW does add an AF assist lamp on their TT1 it will likely be the same implementation as the current Canon AF Assist lights on their flashes. Which is to say that it will still only work in the OneShot focusing mode. If you want to use AI-servo (to track a subject in a dark environment), you’re out of luck. Could you please send me a link to the circuit schematic of this?